Wheat flour may be prepared from various qualities of wheat and should be milled after having undergone a cleaning, dampening, conditioning, and polishing process. (This equipment is also available from ABC Hansen.) 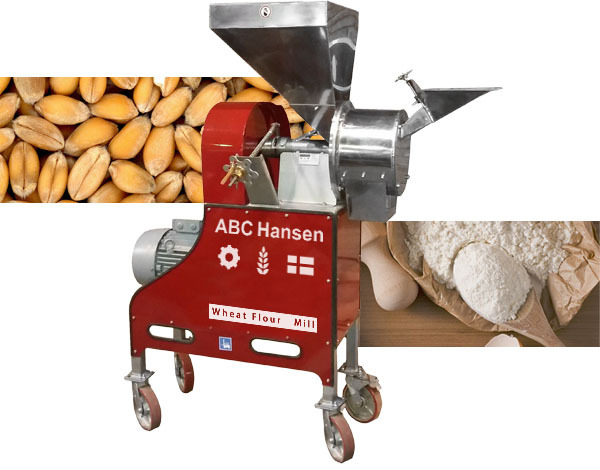 The Universal mill with stone application or a stone mill is a good choice to process whole wheat flour. It is recommended to screen out all coarse particles prior to packing as wheat flour should be fine and not gritty when rubbed between the fingers. Screened out coarse flour may be re-milled and plants may consist of several stone mills and sifters for staged milling. Wheat may be a blend of different qualities for best results. High protein wheat provides the best rising ability for fermented products while low protein flour may be used for cakes and self raising product. Wheat flour is may be used as a thickening agent (corn flour) in preparing soups, stews and other gourmet cooking. Organic wheat products is usually milled with stone mills. Bran and pollard are by-products of the milling process and bran is added to white flour to process brown flour or whole wheat flour. Pollard is used as a filler for processed, soups, stews meat and many other gourmet products and should not be included with white flour when used to bake fermented products as it would negatively affect the rising process. High protein wheat provides the best rising ability for fermented products while low protein flour may be used for cakes and self raising product. Wheat flour is may be used as a thickening agent (corn flour) in preparing soups, stews and other gourmet cooking. Organic wheat products is usually milled with stone mills. Bran and pollard are by-products of the milling process and bran is added to white flour to process brown flour or whole wheat flour. Pollard is used as a filler for processed, soups, stews meat and many other gourmet products and should not be included with white flour when used to bake fermented products as it would negatively affect the rising process.